Make sure your NOOK Tablet is connected to a WiFi network. If the web button on the quick nav bar looks gray and says Disabled, that means you can’t choose it. You’ll have to visit the Wireless Settings panel to fix that. The NOOK Tablet’s web browser should be familiar to anyone who has used a browser to cruise the web on a personal computer. Just like you can on a laptop, for example, you can open additional windows to quickly move from one page to another. To open a new browser window, tap Options and then tap New Window. Address bar. To visit a different page, tap in the address bar. Type an address and tap Go. Back button. To the left of the address bar, tapping the left arrow takes you to the page you most recently visited. Favorites. 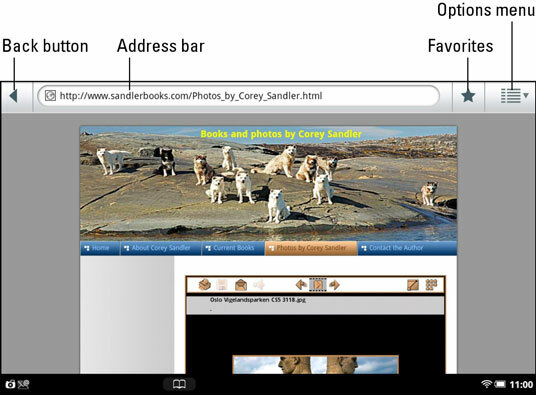 To the right of the address bar, tapping the star opens a window where you can mark favorite sites. You can view and edit the places you’ve visited (browsing history) and organize your favorites. Tap the thumbnail for the page you want to visit. On some computer browsers, favorites are called bookmarks. However, because the NOOK Tablet has an eReader, here they’re called favorites. Same difference. Options menu. At the far right of the address bar, the down arrow opens a menu that lets you open a new window, open the Favorites list, and refresh the screen.